W+K London collaborated with Taxi Fabric. 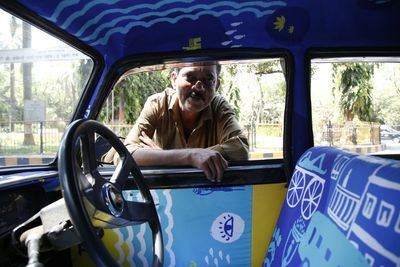 Launched in 2015 by former W+K designer Sanket Avlani, Taxi Fabric has created a platform for celebrating and raising the profile of design in India via a unique medium: fabrics designed for Mumbai taxis. Taxis in India, particularly in Mumbai, are not only the most convenient form of transport but also an iconic piece of culture. However, very little thought is given to the fabric used on taxi seats. Traditional designs that cover taxi seats are often functional and forgettable. Taxi Fabric endeavours to change this, one design at a time. Supported with seed money from W+K London’s Spore Fund (an internal creative bursary) and funds earned via Kickstarter, Sanket eventually went back to Mumbai to dedicate more time and resource to the successful project, which picked up steam while he was working at W+K. As an extension of this ongoing collaboration — and a testament to a shared love of design – the design team at W+K London are working with Taxi Fabric once more. 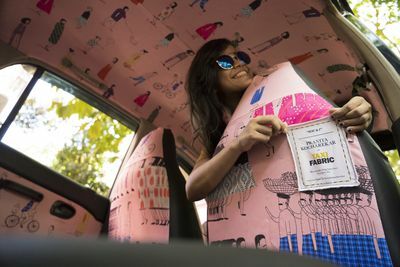 Three designers having created guest fabric designs for three Mumbai taxis. Each taxi was designed around invoking a feeling. When we started this collaboration project, the first thing we did was to interview the taxi drivers to hear the real voice of drivers in Mumbai and learn what they think whilst they drive around the city. Santro taxi collaborated with our designer Olivia, and the driver Vinayak said the below during the interview. I do my maximum taxi rounds from Tata Cancer Hospital and KEM hospital and most of my passengers are patients. As soon as the passenger enters my Taxi they should feel refreshed and calm. My taxi design is inspired by the psychological role of colour and how this could counteract the busy environment of Mumbai. Vinayak, the driver mentioned he wanted an energising and refreshing environment where he could keep his head calm. I found that combining particular hues with mindfulness techniques could encourage Vinayak and his passengers to take a moment to breath and clear their mind. Tobias’ taxi’s theme is ‘Feel Curious’. “I love everything about this city”, Muksed, the taxi driver says. My favourite thing is to drive around Marine Drive near Churchgate and also over Bandra-Worli Sea Link. I want my customers to feel happy and optimistic whilst in my taxi. I was interested in how people experience cities and how a sense of curiosity leads you to find new and interesting places with it. I’ve never been to Mumbai but I wanted to somehow experience what a journey through the city might feel like by abstracting imagery and maps found online. Through its rich and changing textures I hope the taxi fabric inspires a sense of curiosity and wonder about the city, encouraging passengers to seek out places they might not have visited before. I want my passengers to feel that this rickshaw is very friendly and safe for them and there is no danger to sit inside. It is fascinating to think about the idea of transforming the feeling of a space into something completely different to its original nature. How to make people feel safe and calm in a half open rickshaw became the aim of the design. I looked for the moment when I am the most calm and relaxed, which was whilst I was asleep. I tracked my sleep pattern and used this data to generate a unique calming pattern, combined with a use of soft gradient colours. The whole pattern runs throughout the interior of the rickshaw, creating an immersive space that provides a protective and relaxing travel experience. Thinking about how people might experience design inside a taxi in Mumbai, whilst sitting in a studio in London was quite an abstract challenge. So our goal became to create something that could express a point of view about design – something that could transcend culture and form a common language. We talk a lot at Wieden’s about design in an emotive sense – how it makes you feel. A piece of design can stop you, can disrupt, can be playful or just simply breathtakingly beautiful. We felt that this role for design could be universal, so felt like a great place to start. Find out more about our collaboration work on the website. A couple of years ago, W+K designer Sanket launched a project close to his heart and one he’s been working on in his spare time. 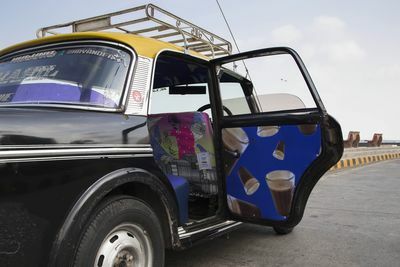 Taxi Fabric sees him bringing emerging Mumbai design talent to the public, by upholstering the interiors of the city’s taxis with their designs. Taxi Fabric started off as a simple blog, and today it is a platform for designers in Mumbai to showcase their work in a unique way. Through this project, Sanket is hoping to raise awareness in India of the impact design can have on people’s lives. Working with a small team, Sanket has fitted five taxis with five designers’ work so far. They are currently working with designers sponsoring their own taxis, but are looking to develop the project further and give even more of the city’s taxis a striking makeover. Sanket has self-funded this project so far but after investing a lot in research and sampling with suppliers, and in order to help emerging designers showcase their work, he has just launched a Kickstarter campaign to help raise the necessary funds to support this growth. If you’d like to get involved, please head over to his Kickstarter page where all sorts of great rewards are up for grabs including the chance to design your own Taxi Fabric. We’re also pleased to say that Sanket is the winner of this month’s Spore Fund grant, which sees W+K awarding a small grant to someone in the agency for a creative project unrelated to work, based on a proposal and budget plan. Congratulations Sanket! Stay tuned for more updates on Sanket’s lovely project.